There are two varieties of Narcissus campernelle, a single flowering form, and a double form. These are very old hybrids the single form dating back to the 17th century. Flowering in spring with fragrant yellow flowers it is a very easy care plant and will multiply to form a clump over time. It grows well in containers as well as in the garden and given a well drained soil and a sunny position it is happy. Easy by division. 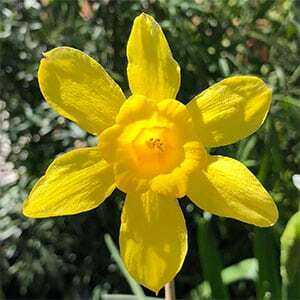 Daffodil bulbs can be lifted and divided after the foliage has died right back in late summer to winter. They are best replanted as soon as possible as this an early flowering variety. Common Name – Campernelle Daffodil.